NETWORK FINALS: QUANTICO lost 0.1 in final numbers, and the BIG BANG THEORY rerun gained the same. CABLE HIGHLIGHTS: USA’s WWE telecast had a strong night at 1.39/1.36/1.35, above last week’s 1.26/1.20/1.15. VH1 had a tougher evening, as LOVE & HIP-HOP fell 0.18 to 1.25, LEAVE IT TO STEVIE dropped 0.17 to 0.86, K MICHELLE MY LIFE lost 0.22 to 0.68, and AMERICA’S NEXT TOP MODEL was down 0.06 to 0.46. The latter was also simulcast on MTV at 0.25, up 0.07 from last week’s simulcast, and preceded there by TEEN MOM, which was down 0.08 to 0.83. On Discovery, FAST N LOUD fell 0.14 to 0.80, and DIESEL BROTHERS ticked down to 0.71. Bravo’s VANDERPUMP RULES slipped 0.03 to 0.57, and SUMMER HOUSE was up 0.03 to 0.28. 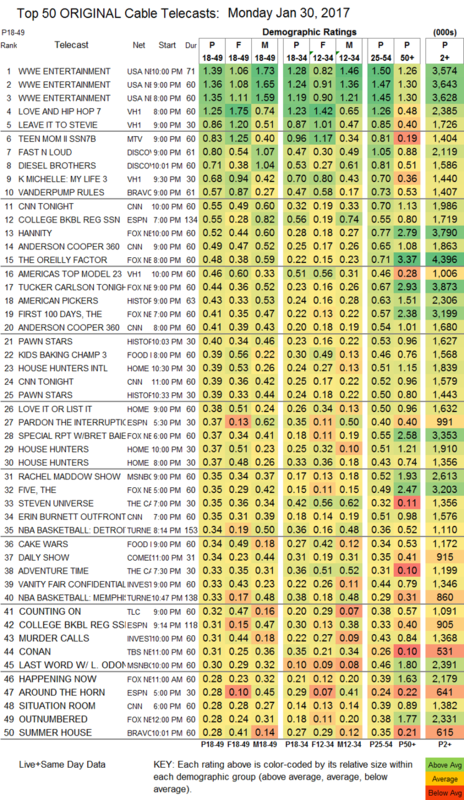 On History, AMERICAN PICKERS climbed 0.06 to 0.43, and PAWN STARS was at 0.40/0.39, compared to last week’s 0.34/0.31. 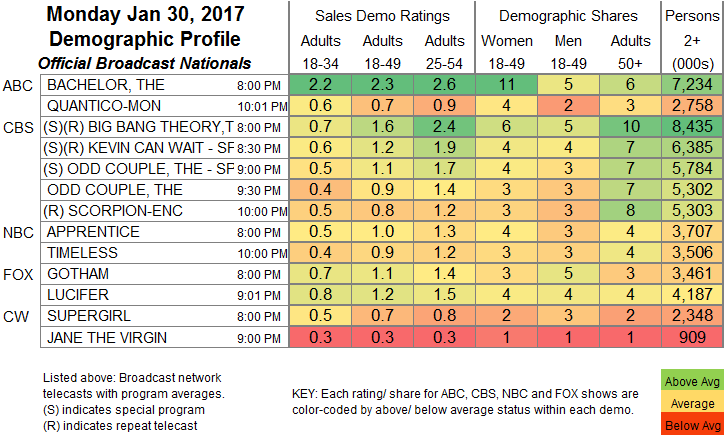 Food Network’s KIDS BAKING CHAMPIONSHIP rose 0.06 to 0.39, and CAKE WARS was up 0.02 to 0.34. HGTV’s HOUSE HUNTERS INTL lost 0.02 to 0.39, LOVE IT OR LIST IT was down 0.02 to 0.38, and 2 episodes of HOUSE HUNTERS were both at 0.37, compared to last week’s 0.37/0.36. On Freeform, SHADOWHUNTERS shed 0.02 to 0.24, and BEYOND dipped 0.01 to 0.13. Nat Geo’s STORY OF GOD ticked up to 0.20. HBO’s THE YOUNG POPE fell 0.05 from last Monday’s installment to 0.10.